Scoreless until the final five minutes of regulation, the Iowa Wild netted the first goal of the day in the late stages of Saturday’s preseason bout, adding another into an empty net in the waning moments as the Roadrunners dropped their final exhibition date by a 2-0 count at TRIA Rink in Saint Paul, Minnesota. It took 55:45 minutes for a puck to find its way into sacred territory, it unfortunately coming off the stick of Iowa’s Mitch McLain during a Wild power play, putting a dent in Adin Hill’s magnificent showing. Hill, prior to McLain’s marker, stopped each of the first 33 shots he faced, and finished his first and only preseason start with 34 saves. Tucson’s penalty kill was tested throughout, and shunned Iowa’s man advantage units on four occasions Saturday before the seal was broken. The Roadrunners killed off nine of the Wild’s 11 power play opportunities during the weekend. The Roadrunners were unable to execute on any of their five power play chances. Iowa iced Saturday’s contest with Landon Ferraro’s empty-net tally with 1:14 left on the clock. 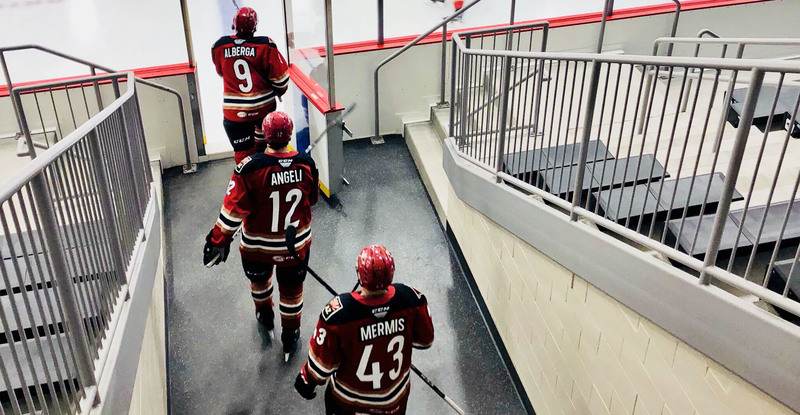 Six skaters that weren’t in Friday’s lineup slid into rotation on Saturday: Forwards Kevin Klima, Hudson Fasching, Patrick D’Amico, and defensemen Dakota Mermis, Jordan Gross, and Romain Chuard. The Roadrunners finished the weekend with a 1-1 record against the Wild, and are now 2-4 all-time in exhibition games, dating back to 2016. The teams each totaled to score four goals during their two meetings.